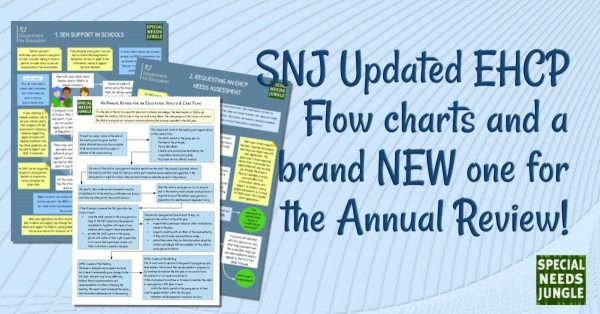 SNJ: Updated EHCP Flow charts and a brand new one for the Annual Review! The EHCP process flow charts that we collaborated with the Department for Education on in 2014 had become out of date since the ending of the Independent Support service. So, I’ve finally managed to tweak them so that they reflect the new state of play AND, we’re also releasing a BRAND NEW flow chart to help you through the EHCP Annual Review. As you would expect from us, the flow charts are easy to follow and understand so they are also suitable for sharing with young people, with support. They are meant to be a ‘headline’ overview, not a deep dive into the legalities of SEND so please don’t email me telling me I’ve missed this or that – it’s meant to be simple. If there is an error, however, please email me (rather than tag me on social media that I will miss). If you want to get in touch generally, this is always the best way (but don’t ask for support services, that’s not what we do). The main flow charts are essentially the same but better reflect our familiar infographic style and, thanks to help with wording from the national IASS Network, I’ve updated the text to show how the government has changed support for families. Read more about that here if you’re not familiar with the changes. As such, the DfE logo remains as the information is unchanged from the original approved co-production, but now more accurate, in line with the support contracts that they issued to the Council for Disabled Children-led consortium. Secondly, so many thanks to our Editorial Assistant and team member, Marguerite Haye, we now have a brand new flow chart to help you find your way through the Annual Review. Actually, Marguerite completed the text for these waaay back before she started her current role as head teacher of a small special school and it’s taken me an embarrassing amount of time to get them made up into flow-chart style. Anyhow, they’re ready now and I hope you find them useful. I’ll be having them professionally printed in larger quantities soon and you will be able to order them via the website in hard copy to be sent out by post. As you would expect for a voluntary enterprise, there will be a small charge for these to cover costs and time. This means they can be shared for NON-COMMERCIAL purposes and many not be remixed or altered in any way. Credit is also required, so logos MUST remain intact. If you would like to talk to us about working together to make similar flow charts commercially (without the DfE logo) featuring your own organisational branding, please get in touch. The flow charts come both with a blue background for sharing and downloading, and with a white background if you want to print them at home to save your ink. Please do share them with parents, schools, GPs, health visitors, CAMHS services and anyone else who needs to have a quick overview of the SEND EHCP system.